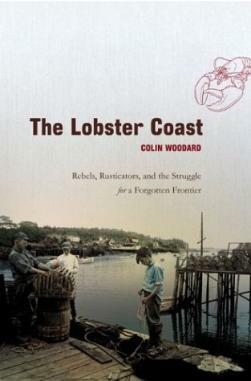 Congrats to Colin Woodard on the publication of his latest book, Lobster Coast: Rebels, Rusticators, and the Struggle for a Forgotten Frontier (details on ColinWoodard.com and Amazon). As blogger, I can't be bothered to fact check, of course (a sad little joke; Colin is something of a blog cynic in my experience), but I gather from scanning the itinerary of his book tour that it was actually published a few months ago. Sorry I'm late. If I may permit myself such an unsupportable opinion, if it's half as good as his first book, Ocean's End, it should be highly recommended reading. Would make a great stocking stuffer.